Timeline is a 1999 title by Crichton, a book filled with an interesting, smart scientific premise and a great framework of historical content and explanation. 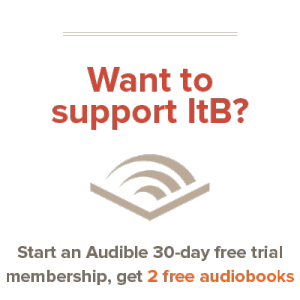 The book opens with a man wandering in the middle of the desert, speaking in rhymes and nonsense, after a couple run him to the hospital and the man dies in a terrible, bloody fashion the plot turns to a company called ITC, run by a wealthy, greedy man by the name of Doniger, trying to clean up the mess that the man in the desert had made. We are then introduced to a Professor and a group of graduate students working with him on an archeological site in France. The professor soon leaves and after a very mysterious discovery, the four students are contacted by ITC, and are made an offer that redefined the impossible. 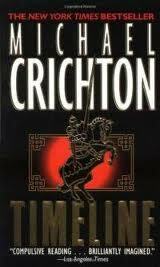 The rest of the book is a roller-coaster ride, and one of the best of Crichton’s I’ve read yet. The book was a very fast and intense read, the pace never letting up, and it was filled with more details than I could possibly list, both in history and in science. Again, Crichton’s meticulous research habits are applied to this spellbinding novel in a flowing, and shining fashion. There are many positive things to be listed in the book, and I will attempt to list some I noticed here. Several times within the novel, the characters put aside their own well being for the good of their comrades, and show genuine concern for one another. As well, one of the characters, Marek, holds fast to a strong belief in chivalry and several times exemplifies it in the events surrounding them. Of course, as spellbinding a read as it was, it was not without it’s low points. Now, I understand that Michael Crichton was by no means a Christian man, and thus I do not expect what he wrote to exemplify Christian values and worldview. However, for the benefit of those reading, I do need to make mention of several things I found improper within the novel. First, there were of course the basic errors that are involved in theories contrary to intelligent design, but these were kept to a minimum. Second, the profanity, while not near as bad as another of his novels, Rising Sun, (which I by no means recommend) there was a smattering of strong profanity and mild profanity was present throughout. If you are sensitive to profanity, then I will say this is not the book for you. Doniger leads off the charge of strong profanity, and as a foul man, he does keep it throughout, and after it dies down for a while, it does pop back up and continued to emerge occasionally throughout the story. Third, while I do not recall any major sexual themes, I believe there might have been one or two references that would be inappropriate for most readers, for instance, there is a scene where it is made extremely obvious that Claire was in a relationship with the abbot, to achieve her own ends. (though not described in graphic terms or including the actual scene itself) Aside from that, no major scenes come to mind. Fourth, and this is back to the worldview statement above, I found Kate to sometimes exemplify herself a lady, and other times took a somewhat feministic role. As a complimentarian, I of course disagree with this worldview, but I won’t hold it completely against the book for the purposes stated above. All in all, it was an intense read with tight prose, unique and well written characters, a just-plausible-enough premise that causes you to be perfectly willing to allow the story to unfold before you. And again, through reading this I have found that yet again the film version of this butchered the book terribly, so if you have seen the film, don’t despair—the book is far better. While I cannot give whole-hearted recommendation, it was a fun read, and discerning readers might find it worth their while, despite the caveats stated above, I can say that I thoroughly enjoyed it. I am in very, very impressed with the science in this book. The level of depth Crichton went to is the greatest I’d ever seen in a Science-Fiction book and it was obvious he had done some research — it really payed off.